Bobblehead featuring Tyler Trent is now available for pre-order in the National Bobblehead HOF and Museum Online Store. 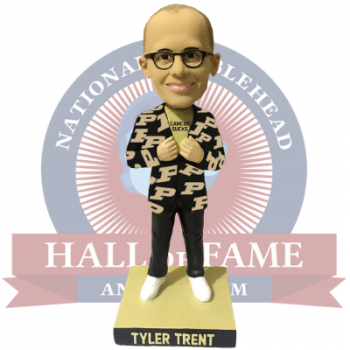 Milwaukee, WI – November 15, 2018 – Today, the National Bobblehead Hall of Fame and Museum unveiled an officially licensed, limited edition bobblehead featuring Tyler Trent, the 20-year old Purdue graduate and football superfan who is fighting cancer. The National Bobblehead Hall of Fame and Museum will donate $5 from each bobblehead sold to two charities of Tyler’s choice, the V Foundation for Cancer Research and the Tyler Trent Cancer Research Endowment. Although Tyler was already famous in the Purdue community, he gained worldwide attention after being featured in an ESPN story in conjunction with the Purdue vs. Ohio State game, which Tyler correctly predicted the underdog Boilermakers would win. The bobbleheads, which feature Tyler in the Purdue blazer with the Purdue logo on the side of his head, are available for pre-order in the Hall of Fame and Museum’s Online Store. The bobbleheads cost $30 each plus a flat rate shipping charge of $8 per order and are expected to arrive in February. Each bobblehead will be individually numbered and come in a collector’s box. The bobbleheads, which are being produced by the National Bobblehead Hall of Fame and Museum, are officially licensed by Purdue University and are being produced in conjunction with Tyler Trent and his family. Tyler discovered that he had a terminal bone cancer after breaking his arm while in high school. In 2014, his right arm was removed from elbow to shoulder and replaced with titanium, but three years later, doctors found cancer in his pelvis. However, Tyler hasn’t let cancer get the best of him, instead remaining positive. Tyler formed the organization Teens With a Cause, which recruits kids to do service projects like mowing lawns, raking leaves and shoveling snow for families that are impacted by cancer. Tyler’s hopeful that research from his tumor, which researchers at Riley Hospital for Children named T-2 for “T-squared”, Tyler’s nickname, will lead to a bone cancer breakthrough. Tyler first captured people’s attention as a Purdue superfan after camping out to be the first in line for the Purdue vs. Michigan football game in September 2017. Since then, his love for Purdue and his positive outlook on life have captured the attention of millions across the country who have learned of Tyler’s story. He was even named the captain of Purdue’s football team and was on the sidelines when Purdue upset Ohio State. An anti-IU chant was even changed to an anti-cancer chant by fans, which led to more recognition for Tyler and his fight. The Tyler Trent Cancer Research Endowment was established to fund cancer research at the Purdue University Center for Cancer Research and donations are currently being matched dollar for dollar by the Walther Cancer Foundation. The V Foundation for Cancer Research was founded by ESPN and legendary basketball coach Jim Valvano with one goal in mind: to achieve Victory Over Cancer®. Since its formation in 1993, the V Foundation has awarded over $200 million in cancer research grants nationwide and has grown to become one of the premier supporters of cutting-edge cancer research.